The Wondering Tree is an interactive book for parents to use with children in discussing and disclosing an abortion experience. 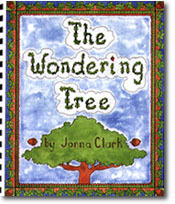 The Wondering Tree opens the way for careful and open communication about a difficult subject. This special book uses an engaging storyline, with pictures a child can color in, to demonstrate God's amazing grace and forgiveness in the lives of a mother and her son. As a past abortion is revealed and talked about in gentle yet honest ways, the bonds between parent and child are strengthened. The Wondering Tree comes with a preface and guidelines prepared by a Marriage and Family Therapist, who specializes in post-abortion counseling, to help parents prepare and decide how best to use this sensitive, yet important information. The story, created by a post-abortive mother and writer, reflects realism while maintaining warmth and the kinds of details children love. To help explain the abortion experience to your children, or as a way to encourage your own healing, we recommend The Wondering Tree.